As the plume of white smoke emerged from the Sistine Chapel chimney at 7:06pm on 13 March 2013, the intense speculation which had surrounded the election of Pope Benedict XVI’s successor drew to a spectacular close. Greeted by an immediate, deafening cheer of exaltation from the crowd gathered in St. Peter’s Square, the few wisps of vapour spiralling into the sky signalled that after two days of voting, a new pontiff – Pope Francis – had been chosen. But in this age of instant communication and media hype, that little puff of white smoke is also a reminder of the intense, arcane secrecy with which modern conclaves are surrounded. Barring this most primitive of signals, no communication passes in or out of the Vatican while the Sacred College of Cardinals is locked in its deliberations and onlookers can only guess at what goes on behind those carefully-guarded doors. Although voting had first been used to choose a new pope in 1061, papal elections during the Central Middle Ages were certainly not the secret affairs that they were later to become. Housed in luxurious fashion, cardinals were free to come and go as they pleased. It was very civilised, but it certainly wasn’t efficient, and provided no incentive for bickering factions to reach a decision. After the death of Clement IV in 1271, this created the conditions for the longest papal election in history. Locked in bitter squabbles, the cardinals argued and squabbled for almost three years without choosing a pontiff. Indeed, it lasted so long that three of the twenty cardinal-electors died while it was going on. The poor people of Viterbo – where the papal court then resided – grew so frustrated with the deadlock that they eventually locked the cardinals into the Palazzo dei Papi and gave them only bread and water until they picked a new pope. Legend also has it that the roof of the palace was also removed, but one way or another, the Viterbesi’s actions gave rise to the word ‘conclave’ (meaning ‘with keys’ – i.e. locked in) and provided the newly-elected Pope Gregory X with the motivation to draw up the laws which were to provide the basis of the modern conclave. Unfortunately, Gregory X’s good intentions took a while to come to fruition, and for the rest of the thirteenth century, papal elections remained fairly chaotic. Medieval cardinals were simply too wily to be shut in without a struggle, and in the election of 1280, the most ambitious of their number were dashing in and out of the Palazzo dei Papi in Viterbo with such eagerness for political horse-trading that it became all but impossible to reach a decision. Eventually, the Viterbesi intervened once again, and violently ejected Cardinal Matteo Orsini and his kinsman Cardinal Giordano Orsini for “impeding” the election. For the majority of the fourteenth century, the papacy was resident in Avignon, where it was to acquire a dreadful reputation for moral dissipation and worldly corruption. It was in Provence, however, that the cardinals also became too cunning for their own good. When they gathered to elect a successor to Pope John XXII in 1334, they all decided to follow the usual practice of voting for a total no-hoper in the first ballot to see which way the political winds were blowing. Unwittingly, however, all but one of the cardinals picked the same no-hoper. The least likely candidate of all, Cardinal Jacques Fournier was accidentally elected Pope Benedict XII. Finally restored to Rome after more than sixty years in Avignon, the College of Cardinals was under pressure from the Roman people to choose a solidly Italian pope when they gathered for the election of 1378. Unfortunately, they were every bit as divided as ever before, and negotiations dragged on almost interminably. In desperation, someone suggested an obscure, but apparently pious archbishop named Bartolommeo Prignano as a compromise candidate. Although he wasn’t a cardinal, and was all but unknown, the exhausted cardinals agreed, and Prignano ascended the papal throne as Pope Urban VI. It was, however, a ghastly mistake. Urban turned out to be a violently unhinged lunatic with a massive persecution complex. Within months, he began locking cardinals up in the Castel Sant’ Angelo and torturing them for his own amusement. His behaviour split the Church in two and catalysed the Great Schism. Perhaps unsurprisingly, he was the last non-cardinal to be elected pope. By the mid-fifteenth century, the Church had recovered from the traumas of the Schism and the rules governing conclave seemed to have become firmly established. But, as the papal election of 1458, the ambitions – and tempers – of cardinals had not been moderated at all. After the death of Callixtus III, Cardinal d’Estouteville was determined to seize the papal tiara for himself. Holding secret meetings in the latrines, he tried to bribe and intimidate his colleagues into voting for him. Things, however, did not quite go to plan. Very quickly, the learned Cardinal Aeneas Sylvius Piccolomini began to emerge as the front-runner. D’Estouteville was furious. After the final ballot, cardinals were given the opportunity to change their votes if they wished, and within minutes, Piccolomini was only one vote short of victory. As Cardinal Prospero Colonna stood up to change his vote in Piccolomini’s favour, d’Estouteville finally lost his rag. Running across the chapel, he and one of his supporters grabbed hold of Colonna and tried desperately to drag him out of the room. A brawl erupted. And in the midst of it all, Piccolomini was chosen as Pope Pius II. Cardinal d’Estouteville’s conniving ways were just a taste of things to come. As the power and wealth of the papacy grew, cardinals lusted after the papal tiara with ever greater fervour, and elections rapidly became dominated by rampant simony. None, however, was worse than the conclave of 1492. The ferociously ambitious and worldly Cardinal Rodrigo Borgia would stop at nothing in his quest to become the next pope, and was reputed to have offered four mule-loads of silver and benefices worth over 10,000 ducats a year to Ascanio Sforza alone. Rome was said to have been awash with Borgia money while the election was going on. But, from Borgia’s perspective, it was all worth it: he was duly chosen as Pope Alexander VI. One of the most obvious features of all conclaves is that voting is restricted to members of the Sacred College of Cardinals. But in 1590, this all changed. In its dual capacity as an elective monarchy and a European power, the Church was unusually sensitive to outside pressures at moments of transition, and since it was to every Catholic king’s advantage that a pope should be well disposed towards his realm, each naturally did his utmost to ensure that his preferred candidate got the job. Previously, kings had simply given cash to their top man in Rome to spend as they thought appropriate, but in 1590, King Philip II of Spain went one step further. Having set his eyes on the French throne, he actually wanted to control the votes directly, and as the most powerful man in Europe, he thought he had the clout to do just that. Just before the conclave met, his ambassador circulated two lists of ‘recommendations’ amongst the cardinals. The first contained the names of the seven cardinals Philip would accept as pope; the second detailed the thirty cardinals that he wished to veto. Suitably cowed, the College did as it was bid, and from this point until 1903, the right of royal veto (ius exclusivae) was exercised by most Catholic monarchs when they saw fit. The election which followed the death of the notoriously nepotistic Pope Urban VIII should have been a foregone conclusion. 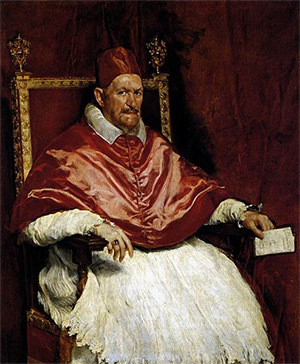 Urban had appointed three of his close relatives to the College of Cardinals, two of whom – the brothers Francesco and Antonio Barberini – were widely perceived to have both the wealth and the ambition to force the conclave to do their bidding. But the Barberini boys had more money than wit, and instead of presenting a united front in the hope of gaining a quick election, they actually split the conclave. An ugly bout of fraternal bickering ensured, with playground insults and mountainous bribes being hurled across the floor during ballots. It was only after nearly bankrupting each other than they settled on Giovanni Battista Pamphilii (who would become Pope Innocent X) as a compromise candidate. After the debacle of 1644, the Barberini brothers were determined not to make the same mistake again, and at the 1655 election, had strengthened their hand immeasurably. But after years of nepotism, the College of Cardinals was worn out, and a group of reform-minded cardinals known as the squadrone volante (‘flying squad’) had begun to form in opposition to the Barberini bloc. The only obstacle to reforming the Curia was, however, the apparent paucity of candidates untainted by corruption. All of the obvious papabili were pretty murky types. In desperation, Cardinal Pietro Ottoboni exclaimed: “we need an honest man!” To everyone’s amazement, the squadrone’s unofficial leader, Decio Azzolino, then pointed to the unsuspecting Fabio Chigi and exclaimed “If you want an honest man, there stands one.” No-one seems to have noticed Chigi before, and when it proved impossible to find any honest alternative, he was duly elected as Alexander VII. By virtue of the fact that Napoleon’s invasion of Italy had forced the Curia to flee Rome and take refuge in Venice, the conclave of 1799 was the last papal election to be held outside of Rome. It was also the last papal election to be held in chaotic circumstances. To begin with, the political turmoil sweeping across Europe meant that there were only thirty-four cardinals present, the lowest number since 1534. Then, this motley little bunch of exiled cardinals was locked out of St. Mark’s Basilica when they refused to accept the Austrian Emperor’s preferred candidate. And even after they had finally settled on a compromise choice – Barnaba Luigi Chiaramonti – some of the cardinals were still grumbling about the new Pope Pius VII’s previous, shocking claim that good Christians could also be good democrats. That Pius VII had to be crowned with a papier-mâché tiara in a tiny little church was a fitting end to the conclave. Alexander Lee is an Associate Fellow at the University of Warwick. His book, The Ugly Renaissance will be published by Hutchinson in September.